Dr. Daria Kring, RN, is a three time alumna of the University of North Carolina at Greensboro School of Nursing. She received her BSN in 1988 and her MSN with a concentration in education in 1995. She was the first graduate of the PhD program in 2008. She has worked as a staff nurse, assistant manager, staff educator, clinical nurse specialist, and Magnet coordinator. Most of her clinical background has been in medical-surgical nursing, with a focus in nephrology. She has published in prestigious peer-reviewed journals including Nephrology Nursing Journal, Clinical Nurse Specialist: The Journal for Advance Nursing Practice, MEDSURG Nursing Journal, and Advances in Nursing Science. She was awarded the Nephrology Nursing Journal’s Research Writing Award for 2009 for her article “Factors affecting quality of life in persons on hemodialysis.” She has received Excellence in Research and Excellence in Clinical Practice Award from Sigma Theta Tau Gamma Zeta Chapter, and the Research Abstract Award from the American Nephrology Nurses Association National Symposium. 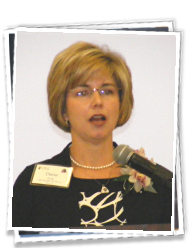 In 1995, she was award the MSN Alumni Excellence Award and in 1999 was the North Carolina Great 100 recipient. She is currently the Director of Nursing Practice, Education, and Research at Forsyth Medical Center in Winston-Salem, North Carolina. In this role she is responsible for leading the nursing department in the use of methods and processes for evidence-based practice and the conduct of nursing research. She has been instrumental in establishing the infrastructure for a strong program of clinical nursing research that has affected quality outcomes, increased nursing and, patient satisfaction, and resulted in financial savings. She is frequently consulted on nursing research and assists nurses to distinguish between research, evidence-based practice and process improvement. She leads a team of 30 Clinical Nurse Educators and Clinical Practice Specialists that use evidence-based practice to design nursing care. Her passion for nursing research in clinical settings is evident in her scholarship, practice, and service.